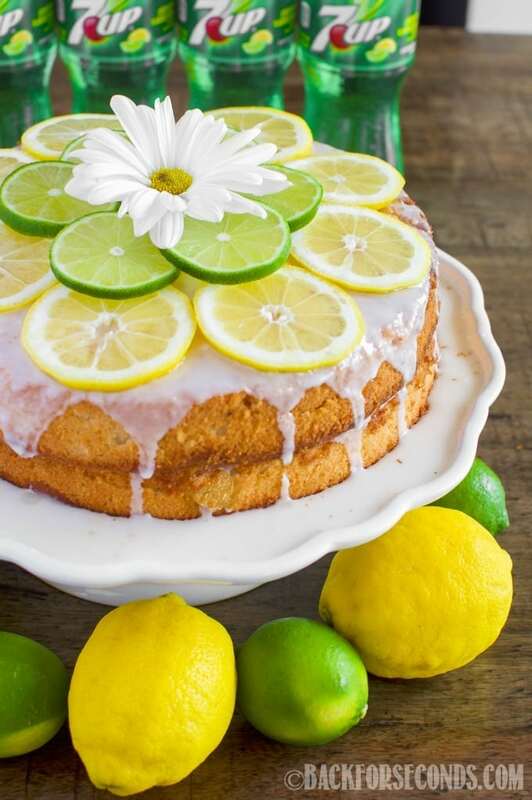 This 7UP® Cake from Scratch with Lemon Lime Glaze is moist and buttery and bursting with lemon lime flavor! The perfect dessert for summertime entertaining! Big thanks to 7UP for sponsoring this post! As always, all thoughts and opinions are my own. Isn’t this cake so happy?! I just screams summer to me! 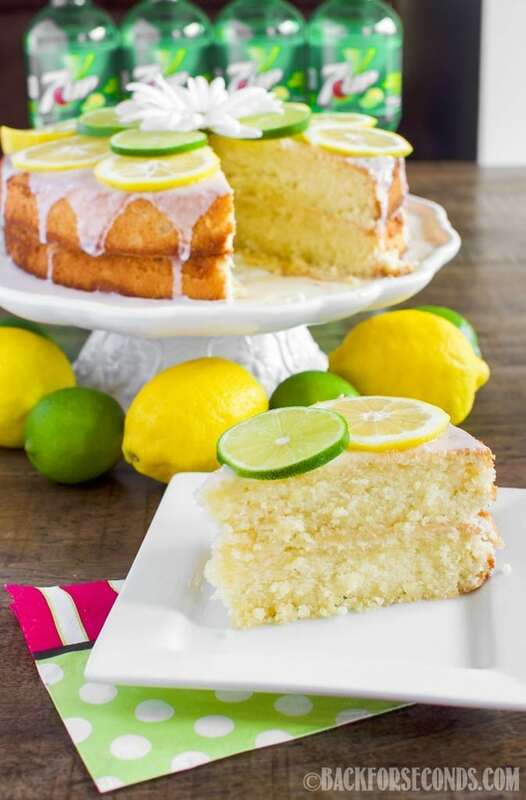 My family loves citrus desserts, and this one is loaded with lemons, limes, and 7UP! 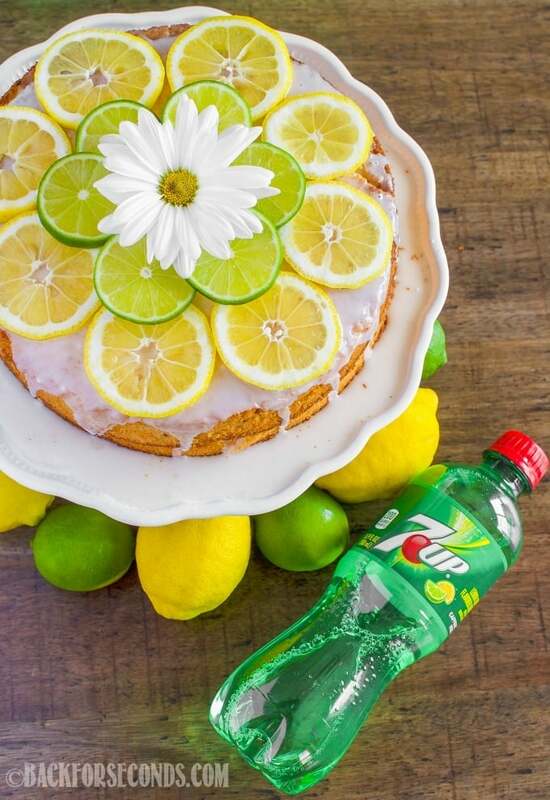 If you’ve never baked a cake with 7UP before, now is the time! It is so moist and flavorful – you’re going to love it! Time for a quick trip to Walmart for some fresh lemons, limes and 7UP! A long time ago 7UP pound cakes were popular, but a lot of the recipes use a cake mix. This particular cake isn’t a pound cake – it’s much lighter, yet it still has a lovely butter taste. No cake mix needed for this recipe either. It’s so easy to make from scratch, even beginner bakers can whip up this cake in no time! I have been wanting to make a cake like this for awhile. The weather is finally warmer and we are craving lemons and limes! The ingredient list for this cake is fairly short, and super simple. You probably have most of them in your kitchen already! Next time you make a Walmart run, make sure to pick up 7up, invite a few friends over, and make this cake! This is such an easy recipe to make, and the finished cake looks so pretty and impressive. The 7UP ensures you will have a super moist, light cake that everyone will rave about! 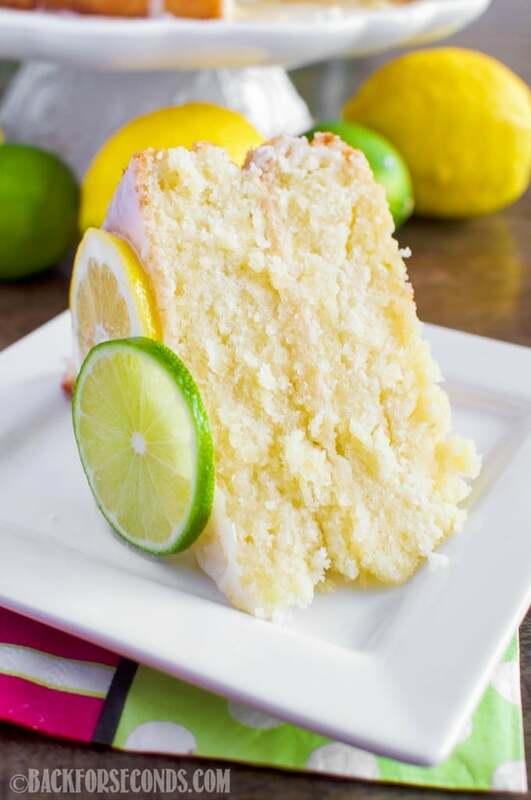 Ohhh, and make sure to get extra 7UP while you’re shopping at Walmart – wouldn’t a fun lemon lime punch be such a great accompaniment to this cake?! Totally doing this for our next summer get together! Get more simple summer recipes using 7UP here! Connect with 7UP on Facebook, Twitter, and Instagram! 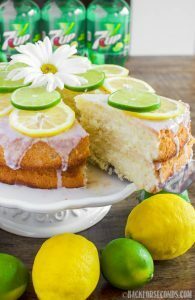 This 7 UP Cake from Scratch with Lemon Lime Glaze is moist and buttery and bursting with lemon lime flavor! The perfect dessert for summertime entertaining! In a large mixing bowl, cream together the oil, butter, and sugar. Add the eggs, mixing well after each addition. Add 7 UP, lemon and lime juices, and zest. Mix until well combined. Pour into 2 greased 9" cake pans. Bake for 35 minutes or until tester inserted into the center of the cakes comes out clean. Let cool in the pans 20 minutes. Run a knife around the edges of the pans, and turn upside down onto a cooling rack. In a bowl, whisk together the sugar and juices until smooth. 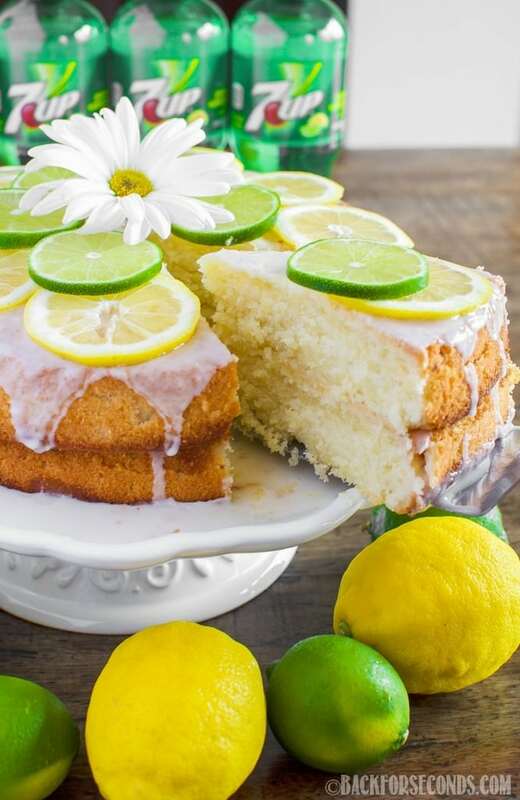 If too thick, add more lemon or lime juice until the glaze is the consistency of glue. Place one cake on a cake stand and evenly pour half of the glaze on top. Place the other cake on top and pour remaining glaze over the cakes, letting it drip down the sides. If desired, top with thin slices of lemons and limes. Enjoy! That is the most beautiful citrus cake that I’ve ever seen! It’s gorgeous! I’m always a fan of lemon/lime flavor! This cake is right up my alley and perfect for Summer! Im so excited about this cake! I’m making for an adult bake-off at our local youth fair and the proceeds are going to help some local children with medical needs! My question is, if its not being served immediately does it need to be refrigerated or left out? Hi Jasmin! What a great cause! I would refrigerate the cake if it’s being made ahead of time. I would add the glaze the same day you plan to serve it though. Good luck at the bake-off! This cake looks delicious! Would coconut oil work for the 1 cup oil? What oil do you use? Have you ever made this with candied lemon and lime? Do you have a recipe to candy citrus?